Red Bulls Sporting Director Denis Hamlett and Ben Mines. @NewYorkRedBulls. The Red Bulls have signed midfielder Ben Mines to an MLS contract. 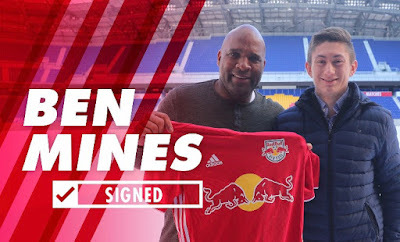 The 17-year old Ridgefield, Connecticut native joined the Red Bulls Academy as an Under-14 player, and is the seventh Homegrown signing on the current roster. "We are excited to welcome Ben," said Red Bulls Sporting Director Denis Hamlett. "We have had the opportunity to have Ben around our professional teams for USL games and trainings. There is a lot of familiarity on both sides and we are glad to add another talent from the Red Bulls Academy to our professional team. This is an exciting day for the club, Ben, and his family." Mines made USL appearances as an amateur in both 2016 and 2017. He made his NYRB II debut in August of 2016, and made five appearances over the second half of the season. He returned in 2017, making 11 appearances and scoring two goals, including an insurance goal in the USL Playoff win at Charleston. "Ben is a good young man and a player with a lot of qualities that we like," said Head Coach Jesse Marsch. "We're pleased to welcome him to the professional ranks and look forward to his development as he trains and plays with us every day." Through the first half of the 2017/18 academy season Mines made 11 appearances for the U18/19s and scored seven goals and eight assists while also playing for NYRB II. Mines won the Golden Boot at the 2017 USDA Generation Adidas Cup, when the Red Bulls finished third overall in the Champions Division, the toughest division in the tournament. It's an amazing feeling," said Mines. "I've been playing here for four years. I love this club and it's a dream come true for me. I just want to keep developing as a player and potentially make my debut for the first team, and give my all to the club." In 2017, the New York Red Bulls led Major League Soccer in minutes from Homegrown players, with 7,810 in the regular season. New York was also the only team amongst the top six in Homegrown minutes to qualify for the Audi 2017 MLS Cup Playoffs.